realestatedevelopmentcoach.com has created this privacy statement in order to affirm our commitment to the matter of privacy of the information given to us by our clients. This site contains links to other sites. 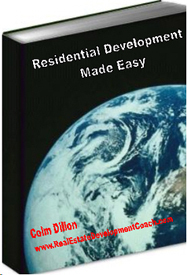 realestatedevelopmentcoach.com is not responsible for the privacy practices or content of such Web sites. realestatedevelopmentcoach.com uses the services of Solo Build It for the production and hosting of this site and both have high standards in relation to the safeguarding of client information and do not sell or rent email addresses of any list member to any third party. Our site's commitment to the privacy and protection is of utmost importance to us.. It is our policy to comply with the Children's Online Privacy Protection Act 1998 and all other applicable laws. Therefore we restrict our Web site to perons eighteen years or older. YOU MUST BE EIGHTEEN (18) YEARS OR OLDER TO ACCESS THIS WEB SITE. IF YOU ARE UNDER EIGHTEEN (18) OF AGE, YOU ARE NOT PERMITTED TO ACCCESS THIS WEB SITE FOR ANY REASON. DUE TO THE AGE RESTRICTIONS FOR USE OF THIS SITE, NO INFORMATION OBTAINED BY THIS WEB SITE, FALLS WITHIN THE CHILD ONLINE PRIVACY ACT (COPA) AND IS NOT MONITORED AS DOING SO.